A source of inspiration. The poster was better than the film, however. So. Sailing ships in space, eh? Frigates crashing into Mars? Where’d that come from, anyway? Unemployment. Looking back, a successful stint of unemployment. Backtrack to 2003. I had been laid off from my previous job and was on the dole inWashington,D.C., looking for a journalism gig. In order to get out of the house, I would go to Starbucks, crashing in a comfy chair and surfing for jobs for a few hours, all for the $1.50 needed to buy a cup of coffee. There was a Blockbuster video store next door to this particular Starbucks. (Remember video stores?) 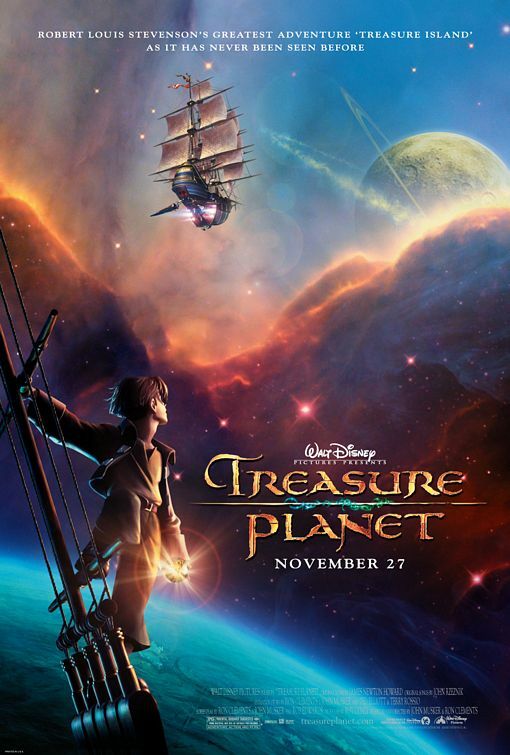 One day, they had a poster up for Disney’s Treasure Planet. It looked campy and hokey and generally bad. And so it was, sadly, when I got around to seeing it on DVD. But the image of a sailing ship…in space? That stuck with me. And in between applying for jobs, I started playing with the idea, bouncing some things off my friends and generally building a universe in which sailing ships from the 18th and early 19th centuries sailed between the planets. It would be richer and more nuanced, inspired not by Disney, but by O’Brian and Forester. It would be historically sound, and yet posit that alchemy was real, and could power these voyages between worlds. For a time, it was going to be a role-playing game, mostly because I didn’t have the confidence in my writing skills to even contemplate a novel. Of course, I ultimately got a job. It was a stopgap job, but less than a year later, I got a real job in New York City. And then we had our daughter, and the writing idea was shelved as we welcomed our beautiful little girl and adjusted to our new lives together. But the idea wasn’t forgotten, obviously. In between then and now, I learned and grew as a writer, and found my stride. In the past couple of years, I also found some time to write. And now, the idea is a novel. Unemployed, tanked on coffee and sucked into the literary vortex by a Disney poster ??? I raise my cup o’ joe to a fledgling novelista and wish him all the best, Tu Tia Juana de Tejas Viva Mike !! !